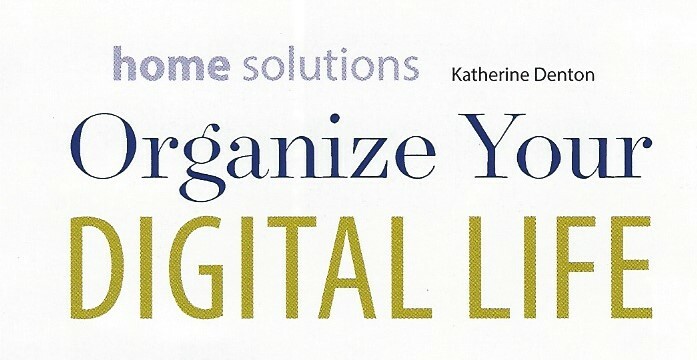 Tips to help you organize your computer desktop and other digital files! The average American adult spends eight and a half hours a day in front of a screen, whether it’s on a computer, TV, mobile phone or other gadget. A collaboration between Nielsen and Ball State University also reported that those who spend the most time in front of a screen are those in the 45-54 age group, who dedicate nine and a half hours to this per day. Considering how much time we spend on our electronic devices, organizing them is just as important as organizing our homes and offices. Does your computer desktop look like the top of your desk? Do you have over a 1,000 emails in your inbox? Do you have a hard time finding documents on your computer when you need them? We can enhance our digital experience by adopting a few of the following tips. Just as you get stress entering an office that has a lot of clutter or is chaotic, you can get that same stressful feeling when your digital environment is in chaos. Your desktop sets the tone for how you start your day. I recommend creating an environment that increases productivity and reduces stress. You can easily create an organized desktop by using apps or customizing your own utilizing Mac’s Keynote or Microsoft’s Publisher. Creating your own is easy. All you have to do is open Keynote or Publisher and use your text box tools to create your own desktop background. I created the desktop pictured here to help me separate different aspects of my life. You can do the same for your needs. Once you are satisfied with your background, export the slide or document to images. Save it as a JPEG or PDF. Next, open up your computer’s Settings tab, click on Display and then click on Background. Click on the option to choose a file and add your image. The internet also offers free apps to help you create a background. They include www.Picmonkey.com and www.Pixler.com. Take a deep breath! This task does not need to overwhelm you. The easy way to handle this common issue is to create a new folder called “Old Files”. Drag all of your existing files into this folder. Create a new filing system with folders that support your needs. Next time you have to search through your old files for something, transfer it to your organized filing system once you find it. Roughly 90% of your old files will remain in the “Old Files” folder. File your documents at the time that you create, receive or download them. Don’t file on the desktop even temporarily. The “Do it now” habit works for electronic files as well. Rename the files you receive if necessary so they will describe them adequately. When you receive revised copies or final versions of anything, be sure to delete the ones they are replacing. Regain control over your email. Constant email alerts and checking fragment your day and reduce productivity while increasing stress. Have set times to review e-mail. When you do, DO NOT, I repeat, do not print every email you receive. Don’t reply to everything. Use your delete key often. Report any junk as spam and move it into your trash. Unsubscribe to any newsletters or promotions you never read. Either Reply, forward or file. Handle each email only once whenever possible. Create an organized filing system with custom labels for each client or project. As a service to others, use the “Reply to all” button sparingly. Send information only to those who need it. And lastly, an empty inbox is a happy inbox!